"McNichols Arena, please," Roy said. Cabbie: "So, are you guys hockey players?" Cabbie: "So what do you think of this new goalie the Avalanche got?" Roy: "I hear he's a nice guy." Cabbie: I don't know about that, but I don't know if he's as good as the team says. They're talking like we've got the Stanley Cup all wrapped up. I don't buy it." 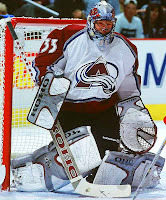 Patrick Roy certainly has had a very interesting life. And it's all on display, through his father's eyes, in the new book Patrick Roy: Winning, Nothing Else. Translated by Charles Phillips, this is the English release of the 2007 French mega hit Le Guerrier , which literally translates into "The Warrior." Interestingly, this book is an initially reluctantly authorized biography. Roy himself says he never saw the need for the book in the first place, turning down several writer requests. But his father insisted it was a good idea. Once Michel Roy began working on the text, Patrick found himself increasingly more welcoming of the project. Yet French media reports from 2007 suggest Patrick only cooperated for the project, and never oversaw any of it. This book is truly a father's story about his very famous son.